The Calendar Punch Out Picture Frame is eco-friendly and made from recycled material. Dimensions: 5.25 " x 6.75 " x .01 "
Ensure that your company information is always within reach, by using the Calendar Punch Out Picture Frame. This eco-friendly magnet is a by-product of iron oxide created during the steel making process, and therefore, recycled material. 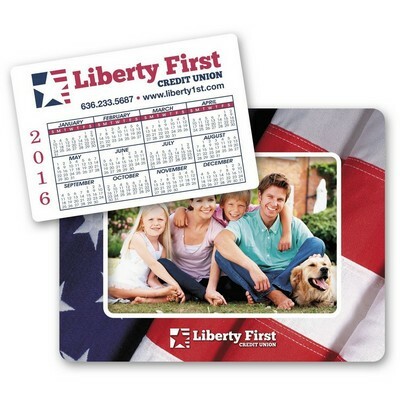 These memorable promotional giveaways feature a rectangular punch out design that reveals a fitting place to display a favorite photo. Kindly specify the year when ordering these magnets. Imprint your company’s name, logo, and special message on the removable portion of the magnet, and along the picture frame, to make your brand a cut above the rest of the competition.